of mortgage defaults barraged the marketplace. Although many of these defaults were a result of a borrower’s actual inability to service the debt, there are many documented cases of a debtor intentionally defaulting on his or her loan in a term commonly referred to as a “strategic default”. The borrower has promised to pay all interest and repay all principal as outlined in the mortgage contract;Defaults and non-payment of loans ultimately lead to depreciation of neighborhoods, so it is a violation of a homeowner’s social responsibility to disregard the property values of his or her neighborhood;If every borrower defaulted, the foundation of the housing market and general economy might collapse. "As a participant and beneficiary of social and economic systems, do homeowners have a moral or ethical obligation to repay their mortgages?" 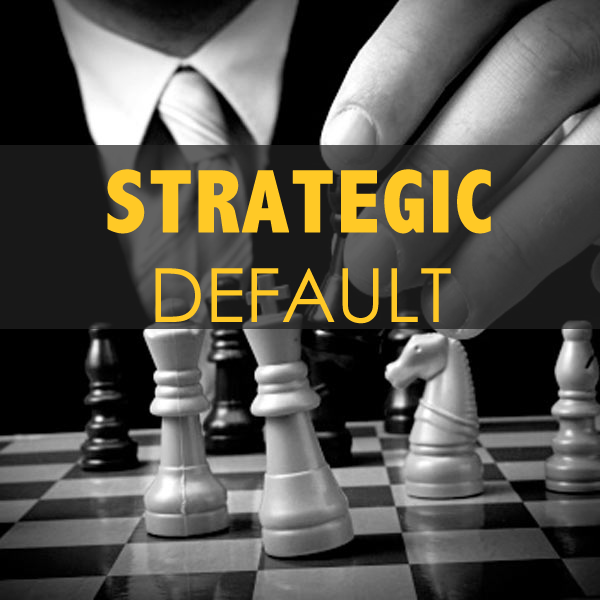 Although initially, an appalling concept, upon further contemplation, the notion of a strategic default does not represent truly unethical behavior, as it is a risk that has already been factored into all models of the mortgage marketplace. Commonly, opponents of strategic defaults point to the borrower’s written commitment to repay the loan. However, it is critical to assess the actual status of the mortgage documents as nothing more than a legal contract. Like all legal contracts, the mortgage documents have been created to contemplate actions that must be taken in a variety of scenarios. Much like an early termination fee written into a utility bill, all parties must rely on the provisions outlined in the contract to take actions that are financially prudent for themselves. "Would it be deemed unethical if a homeowner decided to pay an early termination fee to Comcast because he or she decided that switching to DirecTV represented net savings over the life of the contract?" Much like a fixed termination fee, all consequences of a contractual breach are clearly outlined to all parties engaged in a mortgage contract. Before execution, the lender has considered the risk of non-payment by the borrower and has made a determination in advance as to what fair compensation would be in the event of a default. Given the notion that the lender would not hesitate to pursue it’s financial benefit by foreclosing on the borrower’s property, it can not be argued that the borrower is simply breaking his or her personal promise to pay? This boils down to a simple financial decision, of which the terms have already been contemplated and agreed to by all parties of the mortgage contract. Although initially counterintuitive, the truly moral course of action in a financial collapse may be for a homeowner to stop making payment to a lending institution. The “affordability” or borrower’s ability to repay the loan is represented by a somewhat arbitrary figure, which is derived from the very institutions that are providing loans. In many instances, it may serve the borrower and uphold the social responsibility to divert funds into retirement accounts, education funds, or any other asset class providing higher returns to the borrower as well as net positive contributions to social welfare. If it is immoral or unethical for borrowers to preserve individual financial integrity for future benefit, then why are the lending institutions not equally obligated to contribute to economic valuation by negotiating with borrowers via loan modifications? Can it be considered truly unethical for an individual to protect the future well-being of his or her family by making a financial decision against a lending institution, which has already contemplated, accounted for, and contracted for specific recourse in the event of a default? When entering into any personal or business contract in the United States, all parties are acutely aware that our economy and social practices hinge on a foundation of capitalism. There is no unspoken notion that ultimately individuals will sacrifice personal benefit for the “common good”. In fact, if societal obligations are the basis of an argument against strategic default, why are commercial borrowers asked to sacrifice the personal financial well-being without similar consequences made by the financial institutions that represent the other side of the contract?